This front porch of ours currently has about a foot of snow on it… and we’re stuck inside as an arctic freeze blasts Chicago with -30 degree temps. But that doesn’t mean I’m not daydreaming for warmer weather and already planning the decor of our outdoor spaces. Please, spring, wouldya get here already?!? We have a front deck, back deck, and roof deck (ehh lots to plan for), and a small shared front yard (that will be for a sprinkler!) – but I think how we’ll use each of the spaces will be different. 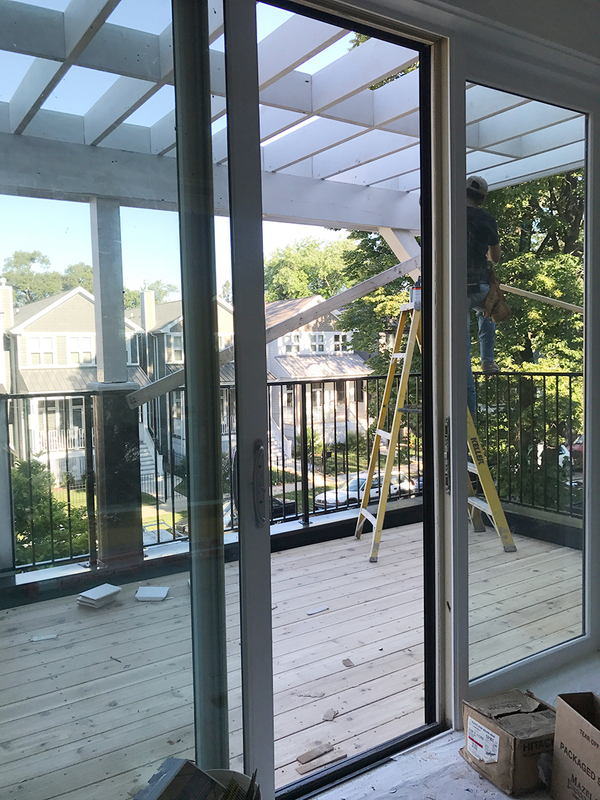 This front deck (shown above) is off of our living room so I envision it being an extension of the living space. The back deck off the family room I think we’ll have a grill and small dining setup for when we have guests over and are cooking out. And I hope to make our roof deck an outdoor family room and possibly even add some garden beds to grow herbs and veggies – if there is space! So for the front porch, I had originally thought rocking chairs but I want it to be a cozier sitting area than that. Now I’m thinking the best layout would be almost a repeat of what we have in the living room: so a coffee table flanked by a loveseat and two matching chairs, all on a rug surrounded by plants. We’ll of course also hang globe lights from the pergola. 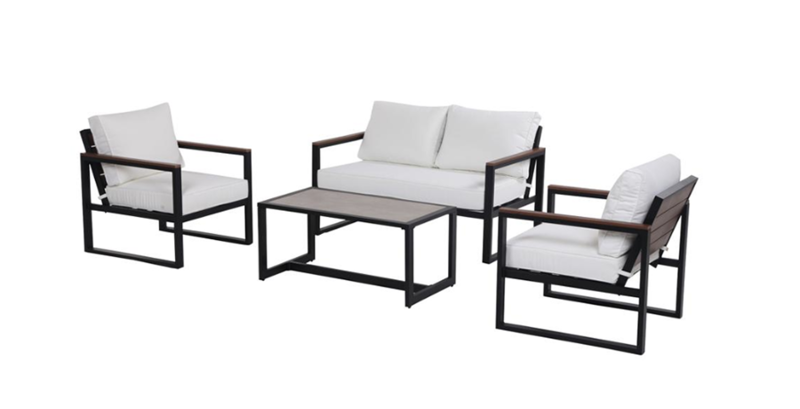 I’ve been browsing the interwebs and found this four-piece set at The Home Depot – part of their Hampton Bay collection – which is exactly what I have in mind. 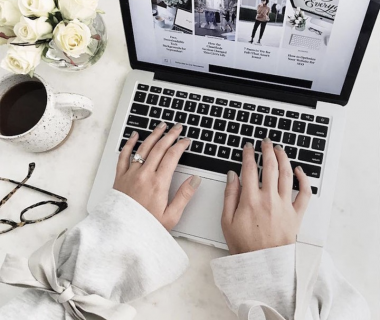 One of my best tips when searching large sites is familiarizing yourself with a few brand names you really like or have the aesthetic you’re looking for – otherwise you can spend hours searching through thousands of items. Hampton Bay is one that typically has colors and lines I like – I’ve also been looking at their sectionals for our roofdeck. I like to stick with light, neutral colors personally (white, grey, or navy fabric), and clean lines. 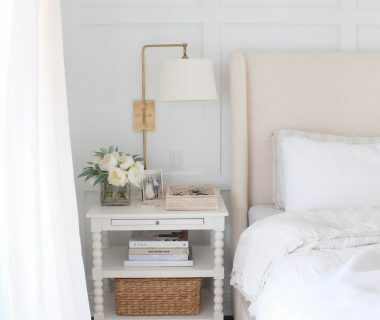 Although they have some wicker-type options that are charming, also, if you prefer a more traditional style! I’d set the two chairs across from the sofa. 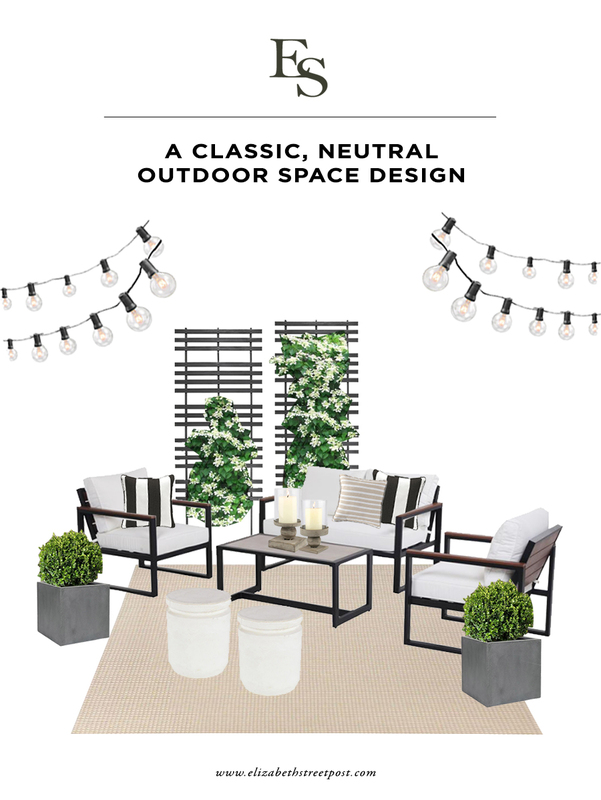 I love that this works in most small outdoor spaces; plus for the West Park set, the CushionGuard fabric is stain, spill and fade resistant – a necessity here in Chicago. If you’ve followed me over the years, you know The Home Depot has been my go to over the years for plants and flowers (and the obvious . I did our entire fall front stoop with products from HD and have bought my Christmas tree from their lots more often than not. They always have a ton of options at great prices. Our boxwoods were $20-30 compared to most shops $50-100 price tags. Fingers crossed they survive this cold. But back to the front porch design! Tada! Globe lights hanging above, boxwood plants to add color, flower vines climbing up lattice for privacy (and prettiness)… and I love the faux cement footstools for additional seating or surface area for drinks and food. And candles. Always always add candles to an outdoor space – ups the mood x100. I’ll post more as I work on designs for our other outdoor spaces! This post was in partnership with The Home Depot but all of the opinions within are my own.